The Star Wars films are famous for their mystical mentors. Fans of the saga have embraced these teachers from the beginning, allowing Obi-Wan to lecture us to "trust our feelings" or Yoda to preach that we are "luminous beings." As it does most aspects of the Star Wars universe, The Phantom Menace makes these sages considerably more problematic. In particular, Master Qui-Gon Jinn has engendered controversy that never seemed to swirl around Obi-Wan Kenobi. Qui-Gon is a skilled diplomat, caring teacher, ferocious fighter, and as wise and calm as any master before him. But while some fans have embraced him as the father they wished they'd had, others have panned him for his occasionally unethical behavior and for insisting on the training of Anakin Skywalker - even over the decision of the Jedi Council. Like most things in The Phantom Menace, the dispute between Qui-Gon and the Council is built on structural opposition. Young Obi-Wan and most of the other Jedi revere the Force as a unifier, an energy field that has to do with destiny. On the other hand, the Force Qui-Gon follows is expressly "the living" Force, highlighting intuition and empathy with all living creatures. Significantly, while Yoda and Obi-Wan frequently sermonize about the dark side as contrasted to the light, Qui-Gon never mentions either. Perhaps he does not even believe in polarization and irreconcilable opposites, light sides and dark sides. By contrast, the Council seems completely focused in schisms of the past or battles in the future, so much so that they fail to take decisive action in the present. It is Qui-Gon who admonishes his disciple to "keep your concentration here and now where it belongs." It is this affinity with the Living Force that enables Qui-Gon to discover both Jar Jar and Anakin, two characters with pivotal roles in galactic history. Without the former, the Naboo and the Gungans would never have been united; without the latter, the Force would never have achieved balance. His focus on the present leads him to the realization that the Sith have returned and that Anakin is the Chosen One. He confronts the Council on both issues, and history proves him correct both times. Qui-Gon is the Jedi Master closest to being a living vessel of the Force. He deals as an equal with aliens others only regard as "pathetic lifeforms," and his faith is unshakable. Confident that "nothing happens by accident," he allows the Force to take him wherever he needs to go. Whether navigating the treacherous waters of Naboo or faced with a broken hyperdrive on Tatooine, Qui-Gon advises his companions to relax and let the Force guide them. He may explain the Council's official stance on midi-cholorians to Anakin, but he treats the Will of the Force as an ineffable but conscious entity. Its mysterious ways never bother him. Many watchers of The Phantom Menace are uncomfortable with Qui-Gon's easy use of the Jedi Mind Trick, or his willingness to lie to Anakin about his blood sample. Perhaps "unethical" actions like these are best understood by looking at Danish philosopher Soren Kierkegaard's exploration of the Old Testament story of Abraham and Isaac. God commanded Abraham to sacrifice Isaac, his only son, as a test of faith - a demand that defied both reason and decency, even though Abraham, as a man of faith, had no choice but to obey. In the end, Isaac was saved and his father was rewarded. In his book Fear and Trembling, Kierkegaard used this story as an example of the frequently absurd nature of the spiritual life, developing an ideal he called the Knight of Faith. Knights of Faith - limited to a select few, who have transcended religion by making an authentic leap of faith - have recognized that their duty was to God, not to local ethics or politics. Kierkegaard called this state of being the "absolute relationship to the absolute," one that cannot be justified by words or reason, and can only be understood by those who have had the same experience. These Knights are released from conventional morality because their actions are a personal command from God. When Qui-Gon tells Obi-Wan, "I shall do what I must," he means he is acting on behalf of the Will of the Force, which is immutable and beyond appeal. He has no real choice in the matter. He walks a narrow course, cannot take counsel from others, and, for the most part, cannot be understood. Though driven by a divine will, Qui-Gon remains humble. He wears the guise of a peasant farmer, and walks easily in the real world. Kierkegaard presents his champion as a commoner who "delights" and "interacts" with others, going home every night to eat supper and enjoy a pipe. And indeed, Qui-Gon looks more at home sitting around a dinner table in a Tatooine slave hovel than in the austere Jedi Temple on Coruscant. Qui-Gon's instinctive sense of connection permeates every situation. He constantly touches his fellow characters, senses a possible sympathetic relationship with Jar Jar, and even - in one subtle moment on the Theed catwalks - shows Darth Maul a moment of mercy. This is irrational, but so is faith. Kierkegaard correctly labeled it as a feeling, referring to it as the "highest passion in a human being." Qui-Gon would no doubt explain the Force in the same way, leaning close and advising in his even voice, "Feel, don't think. Use your instincts. May the Force be with you." 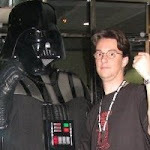 - As I was retyping this, I remembered the phrase "Pure Vessel of the Force" which someone on the Jedi Council Forums had coined back in the day. 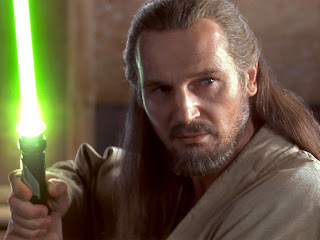 Though it does seem odd now, there was so much controversy surrounding Qui-Gon Jinn after the summer of '99. As for me personally, I gravitated towards him instantly, like a mynock to a power cable. He was the one Jedi who seemed at the top of his game, even amidst the complacency and dogmatism of the Jedi Order. While it certainly works, I'm not so sure I would imagine the Force in the absolute terms that Kierkegaard would have. Obviously I was enjoying showing off the "A" I'd earned in existentialism a few semesters before, though judging from everything we've learned about the Force, it does seem much closer to an elemental phenomenon as anything. Conscious and alive, the Force may possess a particular will or way it wants to naturally flow and manifest, but interpreting it as having a personality is a bit much. I would also question my notion of Qui-Gon not necessarily acknowledging a light or a dark side, though Lucas himself has said these are the "simplest" parts of a very complex cosmic construct. And that might perhaps go along with what we learned in the Mortis trilogy in season three of the Clone Wars. As for Qui-Gon, there has been endless speculation as to what would have happened had he remained for Episode Two and Three. In retrospect, it seems Darth Maul played an absolutely pivotal role in the history of that galaxy far, far away when he pulled that cheap lightsaber-handle-to-the-forehead trick with Qui-Gon and then ran him through. Things would have turned out differently to be certain. Obi-Wan takes too much of the blame when it comes to Anakin's dark fate. After all, he was barely out of his own padawan-hood when he took up the mantle of championing the Chosen One. It was too much to ask of one so young, and obviously the Jedi Council didn't exactly help the situation any. Aside from a stoic lecture from Yoda about loss and attachment, they barely took any interest in Anakin at all. Had Qui-Gon been around, it is fair to speculate he would have allowed Anakin to visit his mother Shmi every now and again. Given his own seeming affinity for her, he may have even facilitated it. Likewise, he would have been a confidant for Anakin when it came to his relationship to Padme Amidala; not a stoic, centuries old master, but a sympathetic and understanding father figure. Not to mention he also would have provided an older mentor that helped limit Palpatine's influence on Anakin, who clearly sets his sights on the young protege hours after Qui-Gon dies on Naboo. As great a Jedi as Obi-Wan Kenobi was, he simply didn't have the experience and wisdom of his late master, nor his deep understanding of the Living Force. As has been pointed out on more than one Forcecast commentary, most of what audiences have grown to know as the Force is rooted right in Qui-Gon's teachings. The Force as an energy field created by all living things, that surrounds and penetrates us, that binds us all together ... all of this is derived from the spirit of Qui-Gon Jinn teaching Yoda and Obi-Wan in their respective exiles during the trilogies. Let's not forget that Qui-Gon Jinn is derived from the Chinese qi-gong, meaning "life force," and the Arabic jinn, meaning "genie" or "tutelary spirit." His name literally translates as "Spirit of the Living Force." Fittingly in one of the last scenes in Revenge of the Sith, we learn that Qui-Gon has indeed figured it all out, that he is the first Jedi ever to pass over into the netherworld of the Force and yet retain his individuality. Perhaps it goes back to the "pure vessel" theory; perhaps he was so one with the Force in life that when death came it wasn't as great a transition for him as for others (William Blake comes to mind, when he remarked that death is merely "passing from one room to another"). Even without time to prepare and disappear, Qui-Gon nonetheless effortlessly merged with the Force. With my help, you can learn to join with the Force, yet retain consciousness. You can join your light to it forever. Perhaps, in time, even your physical self. The ultimate goal of the Sith, yet they can never achieve it; it comes only by the release of self, not the exaltation of self. It comes through compassion, not greed. Love is the answer to the darkness. Yoda muses on this skill. It cannot be granted; it can only be taught. It is yours to learn, if you wish it. Slowly, Yoda nodded. "A very great Jedi Master you have become, Qui-Gon Jinn. A very great Jedi Master you always were, but too blind I was to see it." He rose, and folded his hands before him, and inclined his head in the Jedi bow of respect. The bow of the student, in the presence of the Master. "Your apprentice, I gratefully become." And the Force as we have always known it blossoms into being. *squeals* I'm sorry for my exuberance, I'm just so glad to see an essay about Qui-Gon!! And the essay is beautiful, as everything I've read of yours so far. Thank you! With Qui-Gon as your material, it's hard to go wrong. If I ever do a book on all this, he will certainly rate an extensive chapter. Your article is great and I'm glad I came across it. Love to read a book just on Qui-Gon. The only real Jedi. A friend of mine loved this essay too. :) But it won't let her comment, with a livejournal ID. I adore Qui-Gon Jinn too, such a wise and gentle soul. One of the reasons why I enjoy Qui-Gon so much is that . . . well, he seemed willing to accept his complex nature, instead of accepting one part of it and rejecting another. elysianqui and juanita ... I couldn't agree more. Thanks for being so generous in your comments! After just listening to the TPM commentary last night, Qui-Gon really is one of the best things about the film. From the first time he takes off his hood in the Trade Federation ship to his death at the double-blade of Darth Maul, he just fits so perfectly in the SW galaxy. Much like Alec Guiness' gravitas, he lends the entire film a real heart and soul. Not to mention ... Qui-Gon just had so many great, fun little character beats. The way he teases/plays with Padme on Tatooine because he knows she's the queen; how he deftly catches Jar Jar's tongue during dinner at the Skywalker home; his entire side relationship with Watto, from Watto calling him out on his Jedi mind trick to Qui-Gon's Force nudging of the chance cube ... all their exchanges are terrific throughout all those scenes. Not to mention Qui-Gon coolly kneeling and catching a bit of Jedi meditation while Darth Maul is pacing across from him on Naboo, staring him down like a wild animal. Calm, cool, and collected - that's our Jinn. Qui-Gon and the issues he is involved with are certainly the deepest philosophical meat of the prequels. I too wish that scene in ROTS had not have been cut out. I really feel like it is an important bridge between the pre-OT Jedi and the post-OT Jedi. Chris, it would be great if that were to show up on the blu-ray. I keep hoping against hope that Liam did some more voice work when they were making the Mortis trilogy. Great article. I'd always thought that, in many ways, Qui-Gon was the wisest Jedi. That's for sure. Yoda and the rest of the council were just too blind to see it. Not to mention too arrogant and jealous. Qui-Gon should have had a council of his own without those losers. I never do fanfiction, but I must admit I do want to do a short one with a post-ROTJ Luke conversing with the spirit of Qui-Gon. THAT would be a pretty epic conversation. I like to think of them as the two Jedi Bookends of the saga. I think they "got" it on a level all the others, even Yoda and Obi-Wan, really didn't. That is an interesting thought. I wonder if anything like that's been done in the EU. I agree that these to are SW Saga "bookends" in a sense. I certainly think Qui-Gon "got it" and I have to wonder what would have happened to Anakin if he hadn't been killed. Luke was "too old" to be trained as a Jedi. By conventional Jedi wisdom, it was dangerous to train him. However, he was able to overcome his fear and anger, and neither Vader nor the Emperor were able to turn him, something that Anakin, for all his power, was unable to do. Oh, this takes me back! How I miss those heady discussions of SW philosophy and character that were all over the various web gathering places a decade ago. Thank you for still being out there and saying sensible, interesting, and above all, important things! dbutler, that is one of those questions that keeps fans up at night. I certainly think things would have turned out differently had Qui-Gon not been killed, as noted. I don't think anything like a Luke-Qui interaction has been done in the official EU, but it's kinda screaming for it. Could be very philosophical. And poignant. geo4real, thank YOU for reading. P.S. Thank all of you. This post has had almost six thousand views. Wow. I'm so happy about this essay writing, Qui-Gon is my fav Jedi ever! I think he had a special wisdom and knowledge about the Force, not letting infect him the philosophy of an outdated, declining Jedi Order. Man, do not hesitate to write that book, I'm looking forward to it! :) Qui-Gon is still VERY underrated. This is pretty deep once you absorb all of the philosophies that Qui-gon was really about, compared to the whole jedi order. It shows you the meaning of being a true jedi master. Mind, body, and spirit. I enjoyed reading this. Thank you, sir. Enjoyed writing it. Agreed. Neeson's performance in particular was so solid. I would chalk some of this up to cognitive dissonance. Man, this article is real good! i've found this by just searching some Qui-Gon photos and stuff and i'm impressed on the philosophical and extensively deep search for Jinn's background and the way you make sense of his actions as a whole from the phantom menace trhough the entire saga. And the idea of a Luke conversation with Qui-Gon Jinn force spirit is really cool too. Wish they make it someday on EU. Maybe you should do that fanfic. Thanks for share this for the come people who do see Qui-Gon Jinn as the great jedi master he really is! You're welcome. If you guys loved this, my book has a chapter on Qui-Gon light years ahead of it ..
Qui-Gon was truly the only intelligent Jedi. The arrogance of the Jedi Council screams of jealousy the way the treated him and Anakin. They were so self righteous in treating people who were so obviously more intelligent then they were. Yoda's arrogant speech to Anakin about how his missing his mother (of all things) would lead to fear and then to hate an then to the dark side. Well do something about it stupid. I swear the Sith had already begun manipulating the Jedi council without them having a clue. Their very posture of - the Sith can't have returned without us knowing about it!! Really. Arrogant, self righteous, jealous. Leaving the Chosen One unsupervised except for Obi Wan - smart move guys!! Working for the Sith without even being aware of it. No wonder the Sith had to kill off Qui-Gon right away, they knew he would be the ONLY jedi who could protect the Chosen One. The rest of Star Wars after episode One was just stupid in my opinion showing the complete lack of capability of the very Jedi's themselves. Embarrassing. I like to think of Qui-Gon and Luke Skywalker as the two bookends of the Jedi. The two who got it on a level the others didn't. And this works especially well when you ponder the possibility that the green crystal Luke used to power his saber in RotJ was conceivably the same one as Qui-Gon's that Obi-Wan might have kept in his hut, there's even some visual symmetry there. I was already striving for a life like Qui-Gon represented when episode one came out. And even though we only really have this part of his story to go on in both movies and related books, he is definitely up there in most inspirational figures real or imagined in my life.